@Romi's Studio: give-away? give-away? why yes! With the permission of the marvelous and talented Miss Babs, who provided yarn for Fiori Autunnali, I am giving away a skein of her gorgeous Wild Silk (100% tussah) in Roasted Pumpkin, the color used in the original shawl! Along with that skein of loveliness will go beads enough to complete the shawl. These are also the original beads used: size 6/0 Japanese seed beads in iris bronze (metallic). This all goes along with my new Craftsy class, of course. :) And here again is the link to purchase that class for 25% off! Here are the rules! Leave one comment here by midnight PDT, Saturday night July 27, 2013. Each comment will be an entry. If you would like to enter more than once, tweet, or post on facebook, plurk, or Ravelry (or other social media!) about the give-away and then post another comment here telling me what you did. If you tweet and facebook, for instance, that's two extra comments for two extra entries! I will draw one winner from the list of comments, using random.org's random number generator. Ready? Set? Go!!! I love your patterns! I've made a few already and have purchased some of your 7 Small Shawls. I've also used some of Miss Babs' yarns before. Thanks for the opportunity to win this! This is so beautiful! Elements of three of my favorite Romi shawls all in one. And in such a lovely color! All of your work is beautiful! I've never had the opportunity to use Miss Babs' yarn before. I'm definitely a fan of all your work, but this is beautiful stuff! I'm so excited to actually have some visual tutoring for lace knitting. Being self-taught leaves me always wondering why certain stitches don't quite look like the expert knitters and asking, "Now what am I doing wrong?" Now I'll be able to SEE how to do it correctly!! Thank you Romi! Oh, drool. just, drool. Miss Babs silk and Romi's design? Drool. Wow! The beauty of the shawl and your generosity are overwhelming. Yes, please enter me in the drawing and thank you. I RTed on Twitter (I'm @WordLily there). Congratulations on beautifully done Craftsy class. You are FABULOUS! I just came >< that close to buying the yarn because I love the color, but I'll wait to see if I possibly win something for the first time in my life. The last two shawls of this year's patterns are gorgeous ! I am spinning to knit the blackjack ... while on vacation I hope ... The contest invited me to comment. Since I never win I will be glad for whomever is the lucky winner. I Love the new design for the class. The yarn is so beautifull - just love it!!!! I re-tweeted on twitter but my account is private. What a beautiful shawl! And what a lovely colorway! What a lovely shawl and what a lovely colorway! What a fantastic giveaway!! This shawl is so stunning! Love the pattern and the yarn colour. I would be so excited to win this yarn to match the pattern. What a beautiful shawl. Would love to do it in the original yarn. That is a beautiful shawl and I am a sucker for anything lace and beaded! I shared your status on my facebook page. Gorgeous, just like all of your designs! Congrats on your class!! I hope I win. This shawl is amazing! I am sure the class is spectacular! Seriously?! Well, I know I'll get it anyway but winning is SO much better. I wonder if I'll ever get through all your patterns...it'll be fun to try! So gorgeous, what a beautiful yarn/pattern combo! Oh, and you bet I'll tweet, plurk and Facebook! The more, the merrier! Oh, I also tweeted about it! I love this new design and I love Craftsy classes. Seriously considering taking your class at some point. I love this! The yarn is beautiful! It's gorgeous! I look forward to knitting it! How exciting! I love your shawls & would love to get my hands on Miss Babs! This is so gorgeous and such a great idea for a Craftsy class. I love your patterns and have purchased several of your books. And this color is absolutely gorgeous. And I will be doing your Craftsy class. A beautiful yarn for a beautiful pattern. How can I resist? I shared on FB and Twitter also. I'm so excited to have bought yours class. I also invited all my knitting friends and family to sign up for the class. You are amazing! Teach me! I also shared on Face Book. Yarn? Did someone say yarn?? Love your designs! Teach me! The shawl is beautiful! And I love the yarn. Rosemary, you've done it again!!! This is so beautiful, it is definitely going on my to knit list. love the color of the yarn and the pattern! Another fabulous shaw, that I was not planning on knitting! Bought the class and watched it, now if I can get my fingers to work the belly button magic, it will be a miracle. Once my arm is healed from surgery, I will attempt to do the belly button start myself, instead of paying some to do it for me! Lace is my favorite!I'm a knitter!I'm a winner? Beautiful pattern as always, and in one of Miss Babs yarns......perfect combination! Would love to win. Shawl looks amazing. Pdkeller on ravelry here. Stunnning as usual Romi! Would love to win this and give it a go! I'd love the yarn & beads! The pattern and yarn are both lovely! Thank you for the giveaway...I am looking forward to trying your beautiful patterns! Love the shawl and love your patterns will be trying one soon. Knitting one of your shawl patterns is on my to-do list. Winnng the yarn will move it to the top of the list! Both pattern and yarn are gorgeous. Love it. Love it and I want it! Woot! maybe I'll win this time! All of your shawl patterns are so beautiful, Romi, I would love to knit this one too!! Thanks for the giveaway. I love the color, the pattern, the yarn, the everything! Ok I posted a thread on my guild group on Raverly! I love your patterns! I also enjoyed meeting you at Stitch West this year! Romi I'm so happy to be a part of your group. Your patterns have challenged me to be a better knitter and learn something new with each new pattern. I'm so excited to learn to knit this new lace shawl from your Craftsy class and it's so great to finally meet you on the Craftsy platform and see your beautiful personality. Thanks. I'm so excited to finally take a class with you! You bring us so many hours of pleasure, it's thrilling to actually learn from you! Congratulations on your first Craftsy class, I'm sure it will not be your last! Romi's pattern and Miss Babs yarn-----what a fantastic combination!! That is the prettiest shawl I have seen and thank you Romi for the chance. Miss Babs makes some lovely yarn, though I've never used her tussah. I'd definitely be willing to take that off your hands ;). Your new design is gorgeous, put it right in my queue so I will knit it soon! What a gorgeous shawl. It just calls out to me to be knit. I've signed up for the Craftsy class. Thank you for this giveaway. Winning the yarn to make the shawl would be the icing on the cake. Love your patterns, working on my second one now. They are beautiful. Have progressed to lesson 3 of your craftsy class. Simply divine! 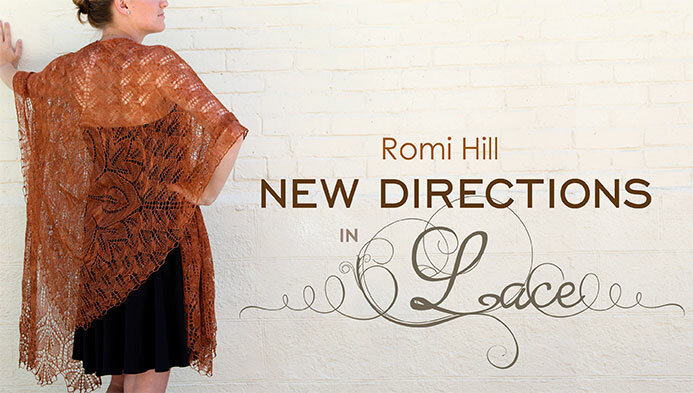 So many Romi shawls that I love and so little time to knit them all! I love the Craftsy platform, and I love knitting lace! I signed up for the class and can't wait to start as soon as my yarn gets here. I signed up for the class and am excited to get started! Thanks for the chance to win! The shawl is lovely! What a beautiful pattern and yarn combination! Thank you for the opportunity to win some of Miss Babs' yarn. Another gorgeous pattern, Romi. There's a lot of knitting there, but it's nice to see a full blown BIG shawl. Congratulations on joining the Craftsy team. And many thanks to Miss Babs for a luscious giveaway. Stunning, amazing, fabulous......just like you!! How generous of both of you. Match made in heaven! romi and miss babs! A very elegant yarn that I would love to win so I could knit your shawl. So happy to see this Craftsy class. Somewhat new to lace and your patterns are so gorgeous but I find the finished projects appear somewhat intimidating in choosing to tackle - so this will be great having the class to help me along! Miss Babs yarn is lovely and I love the pumpkin color! Spectacular shawl and would love to try out this beautiful yarn! Beautiful shawl. Tanks for the chance to win the yarn and Beas to make it! What a wonderful opportunity to knit your beautiful shawl in such a lovely color. Congratulations on your Craftsy class. Hi Romi, I didn't know you were doing a class for Craftsy. That's terrific. I love their classes and have quite a few. Most likely, I will sign up for yours also. I love your shawls and would love to win this yarn and the beads. I have posted your giveaway on Facebook.... Such fun! Love your designs! I can't wait to do another Romi shawl! Posted this on the Ravelry forum of my local knitting friends. Really, really want to win this yarn! Thanks in advance for picking my lucky number! Loved the original Fiori and now this fall beauty.... to win a skein would be wonderful. Thanks for another lovely design. Oh, how nice, Romi! Thank you. congrats on your class on Craftsy! Miss Bab's yarn is my favorite! This shawl is too stunning for words. I really hope I win! Being able to knit one of Rosemary's shawls with this beautiful yarn is just the best! Romi, your shawls are awesome! I can't wait to start Fiori! Shared the class link on Facebook, too! I would soooo love to win the yarn and beads to make that shawl! Beautiful shawl. I love it! Oh no! How will I ever get around to knitting Fiori with this new version as well. The problem of an overabundance of lovely designs....I'll take it! Wow, beautiful yarn for a beautiful shawl! I would love to try Miss Babs yarn. Gail (mygrammadid) spread the word! Well and Ravelry... "the BEST social network online. But you have to knit"
This is a gorgeous shawl meant to be an heirloom! I've already signed up for the class. the shawl "Fiori Autunnali" is amazing. I'm falling in love when I saw him. Now I hope to win this beauty of yarn. You design such lovely things! I would love to make this shawl - all your designs are so lovely. Calliope's Odyssey is in my queue for next month. Lovely yarn. Fingers crossed I win!! Can't wait to start your class! The shawl is so beautiful! Love the color perfect for fall! This will be my 2nd lace weight project. I am very excited. Hope I win! Can't wait to start your class! It is a beautiful pattern. This will be my 2nd lace weight! The color is just perfect for fall. Hope I win! Love your designs. Congrats on the craftsy class. I just posted about your class, pattern and drawing in my favorite spinning group on Ravelry! Fiori Autunnali would look fantastic in handspun. Oh my goodness, another beautiful shawl! And I can't wait to see your next series of 7! I was just cruising around in Miss Babs website yesterday for the first time. It must be a sign! ps: congrats on the Craftsy course. It looks amazing. this looks exciting! so much fun! Your shawl patterns are so awesome. The patterns make one think but no too much. I can't wait to do your Craftsy class and have your wonderful voice included with your work. You know by now what a huge fan I am of you. 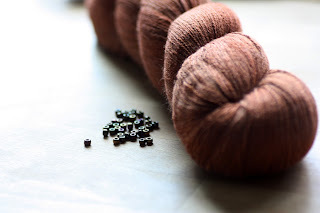 I purchased your Craftsy class yesterday and would be over the top excited to win a beautiful skein of Miss Babs silk yarn to make the class project. Thanks for the class and giving me this chance to win. I would like to be entered 2 more times. I have posted on Twitter and Facebook. Thanks Rosemary. Oh yummy yum yum! Love your pattens, have all of the 7 small shawls books and a couple more patterns to boot! Fingers crossed. A truly magnificent shawl. I hope that I win! Thanks!